Significant long term savings can be made by using natural, energy efficient materials in new build and retrofit homes, according to University of Ulster academic Dr Norry McBride. Dr McBride, Director of Academic Enterprise, was addressing a one day conference on the ‘Economic Benefits of Energy Efficient Building’. The event in Templepatrick, which highlighted the economic benefits of energy efficient construction materials and showcased examples of best practice of natural and sustainable construction was organised by Ulster Business School, on behalf of the NEES project (Natural, Energy Efficient, Sustainable) and supported by the Knowledge Club, was attended by academics and practitioners from both the public and private sectors. The University of Ulster is a research partner on the INTERREG funded Northern Periphery Programme NEES project; a transnational collaboration with partners from; Greenland, Sweden, Scotland and Republic of Ireland. The NEES project is investigating the potential of using recyclable and natural materials to make buildings more energy efficient. According to a recent United Nations report, scientists are 95% sure that humans are the ‘dominant cause’ of climate change since the 1950s. Efforts to reduce carbon emissions by increasing renewable energy production have had the negative side effects of raising energy costs. Ulster researchers however maintain that increased energy efficiency does offer a sustainable and cost effective method to supplement the production of renewable energy. Mr Derek Bond, lead investigator in the NEES project and Senior Lecturer in Ulster’s Department of Business and Enterprise added that developing a more localised supply of building materials would be one way of driving down the costs as the rising cost associated with the transportation of construction materials is having a knock-on effect for homeowners. Other contributors to the conference speakers included representatives from University College Cork, Northern Ireland Housing Executive, Invest Northern Ireland, Down District Council, Oaklee Homes Group, and Prof Tom Woolley of Rachel Bevan Architects and the Alliance for Sustainable Building Products. For more information on the NEES project please visit: www.neesonline.org Presentations from the conference will be available at http://www.business.ulster.ac.uk/events/NEES/ in the coming days. 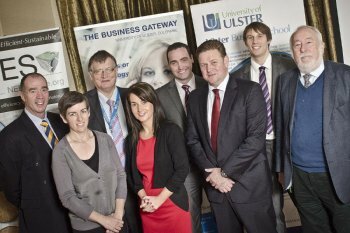 University of Ulster academics and practitioners from both the public and private sector pictured at the one day conference on the ‘Economic Benefits of Energy Efficient Building’. The event in Templepatrick was organised by the Ulster Business School, on behalf of the NEES project (Natural, Energy Efficient, Sustainable) and supported by the Knowledge Club.